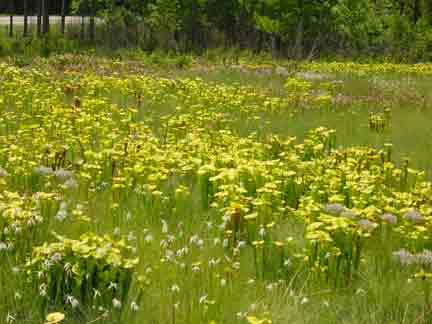 Traveling the back roads of Alabama we passed this field of carnivorours plants. We were hoping to see a few Pitcher plants along the roadside when we came upon this large field. It had a slight slope and we wondered how these plants did so well when they usually grow in bog areas. We stopped and had a nice chat with the owners. The hillside has seeping springs which are common in the area. The springs kept the hillside always damp. The couple burned the field every other year. This kills the young trees, especially fast growing pines, without hurting the dormant bog plants. This lets in the sunlight these plants need. This used to occur naturally. The boggy areas went back up the gentle slope for quite a ways and was covered in bog plants. The plants were not flowering but there were patches of color with the mix of varities and species. The main species seemed to be Sarracenia flava, the Yellow Pitcher Plant. The camera just couldn’t capture the colors There were many varieties or forms of this species. “Copper Top” was very common. There may have been hybrids but I’m not informed enough to know. Mixed in with these were some Purple Pitcher plants and lots of sundews, mostly Drosera intermedia. There were once large fields of these different genera and species of bog plants. The unique conditions these plants need are rapidly disappearing from the southeastern U.S. We’re going to lose something so strange and beautiful if we let these areas disappear.